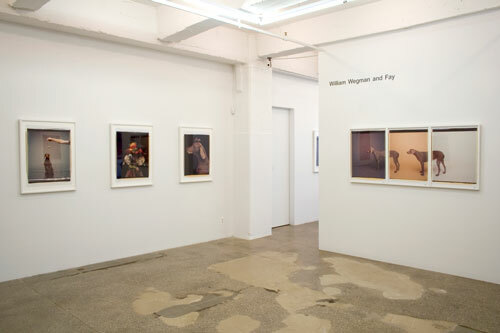 Senior & Shopmaker Gallery is pleased to announce William Wegman and Fay: Polaroids 1987-1995. The exhibition, opening on the 25th anniversary of Fay Ray’s birth, features more than eighteen Polaroids documenting the remarkable artistic collaboration between the artist and his four-legged muse. All of the photographs were selected from the artist’s archives and have never before been exhibited. In 1979, Wegman, who had been working in video and small-scale black-and-white conceptual photography, accepted an invitation from Polaroid to work with their new 20 x 24 format camera. Designed to produce life-sized portraits of amazing clarity and detail within an instant, the large camera offered spontaneity, scale, rich color, and the possibility of creating serial images, thereby engaging Wegman and his dogs from Man Ray, Fay Ray, and her progeny for the next three decades until the company’s financial demise in 2009. Polaroid’s restricted production of film material coincided with the artist’s move towards digital photography beginning in 2002. The format of the Polaroid camera forced the artist to think in terms of its vertical frame, a compositional challenge he met by elevating Fay on pedestals and furniture, draped in cloth, or wearing gowns and costumes. These shots developed into a number of hybrid human/animal characters reflecting the widespread impulse in these years toward narrative portraiture, as seen also in the work of Cindy Sherman and Laurie Simmons. Present in the Polaroids as well as in his paintings, drawings, and text-based work, is Wegman’s postmodern preoccupation with the work of other artists: Arcimboldo, Picasso, Donald Judd, and Eadweard Muybridge, to name a few. Perched on wood cubes, decked with fake fruit, or seen in profile like a Renaissance Florentine dowager, Fay, as animate raw material, provided a foil and inspiration for Wegman’s daring and hilarious subversions. William Wegman’s photographs, videotapes, paintings, and drawings have been exhibited in museums and galleries internationally. Numerous traveling retrospectives of Wegman's work have been organized over the past three decades, among them Wegman's World, which opened at the Walker Art Center, Minneapolis in 1981, and William Wegman: Paintings, Drawings, Photographs, Videotapes, which opened at the Kunstmuseum, Lucerne in 1990 traveling to venues across Europe and the United States including the Pompidou Center, Paris and the Whitney Museum of American Art, New York. In 2006, the Addison Gallery of American Art, Andover, Massachusetts organized Funney/Strange, a comprehensive retrospective of the artist’s work that traveled to the Brooklyn Museum of Art, Brooklyn, New York; the Smithsonian American Art Museum, Washington, DC, the Norton Museum of Art, West Palm Beach, Florida, and the Wexner Center, Columbus, Ohio.